Flat roof ponding water: This roof of this row house is holding between 1.5″- 2.5″ of water across much of its surface. 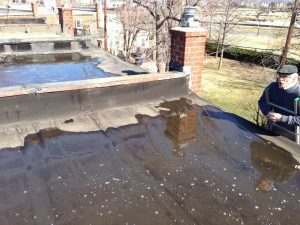 Ponding water on a flat roof can be a huge liability; when the roof develops a leak (it will) there will be a ready supply of a hundred gallons or more of fetid stagnant water waiting to pour in through the breach. 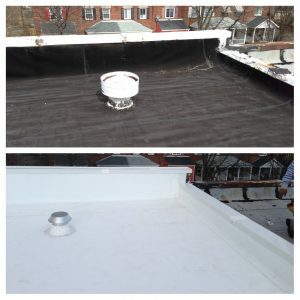 The pictures below will take you through a standard installation of a new White Firestone TPO roof on a row house in Alexandria, VA. We’ve done hundreds of these projects; the owners are typically thrilled because not only do they have a new waterproof roof but the bright white surface keeps the upper floor much cooler in the summer. When I took this picture it hadn’t rained in two weeks yet there was still an inch and a half of water on the roof. You can see the neighbor has the same problem with water standing on the roof; whether by design or because of settling almost all of the houses in this row have some amount of standing water. At the time of the picture it hadn’t rained in over two weeks. 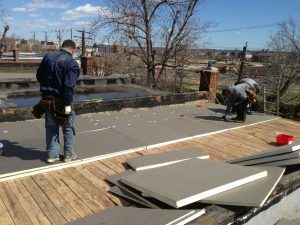 This roof had two layers of roofing for us to remove. 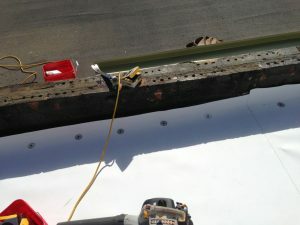 The upper most roof was a torch applied modified bitumen roof, basically sheets of asphalt that are melted in place with a large open flame propane torch. 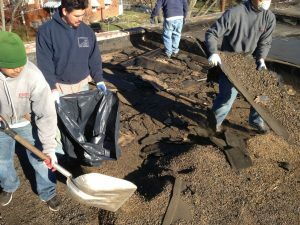 The lower roof was a built up roof, which is alternating layers of tar paper with layers of hot liquid asphalt that is then coated in gravel. 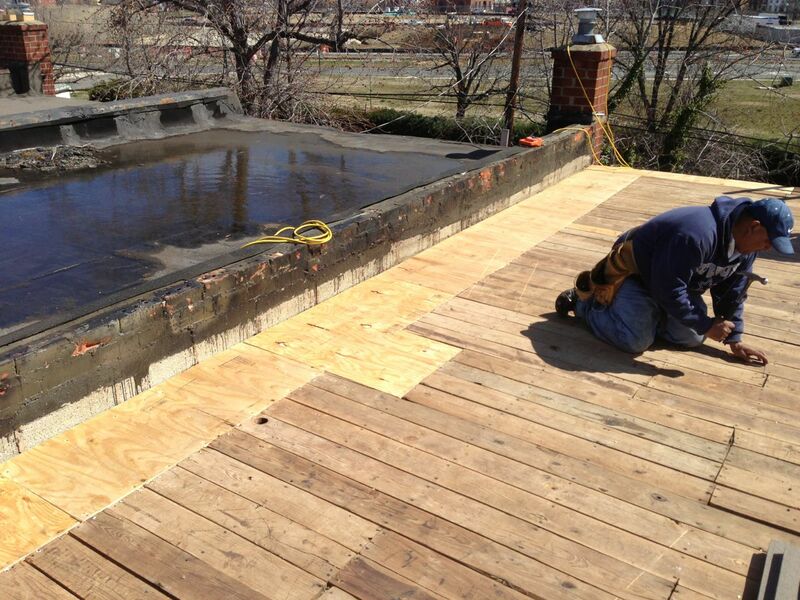 After the old roofing was removed we found rotted decking around the outer edges of the roof, we replaced the rot and renailed the existing roof decking that was in good shape. 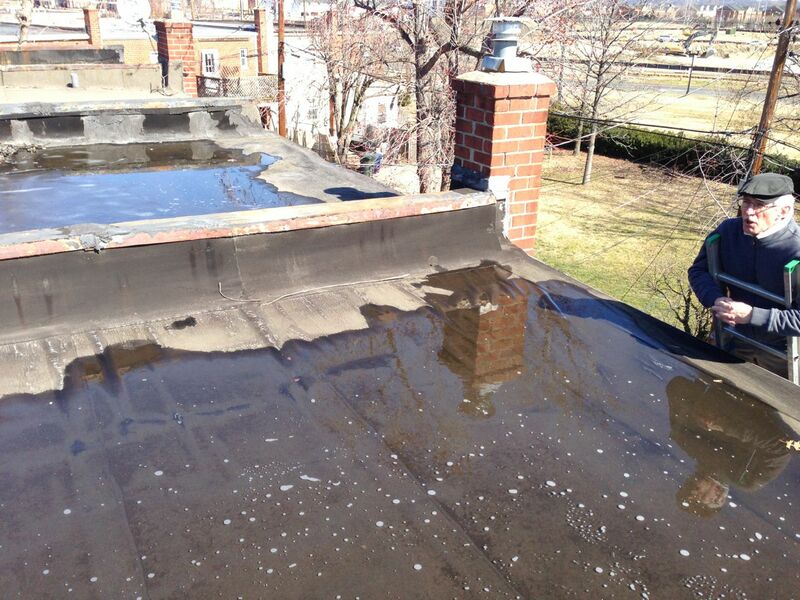 Despite the dismal condition of the existing roof the owner had no indication that the roof was leaking, the lesson here is to have your roof checked by a professional at least once a year. lling tapered polyisocyanurate insulation board. 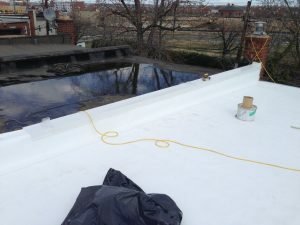 Instead of holding water the roof now slopes from .5″ at the gutter to 6″ at the front wall; in a matter of hours we basically built a 5.5″ tall hill on top of the roof that will keep rainwater rolling off the roof and into the gutter where it belongs. 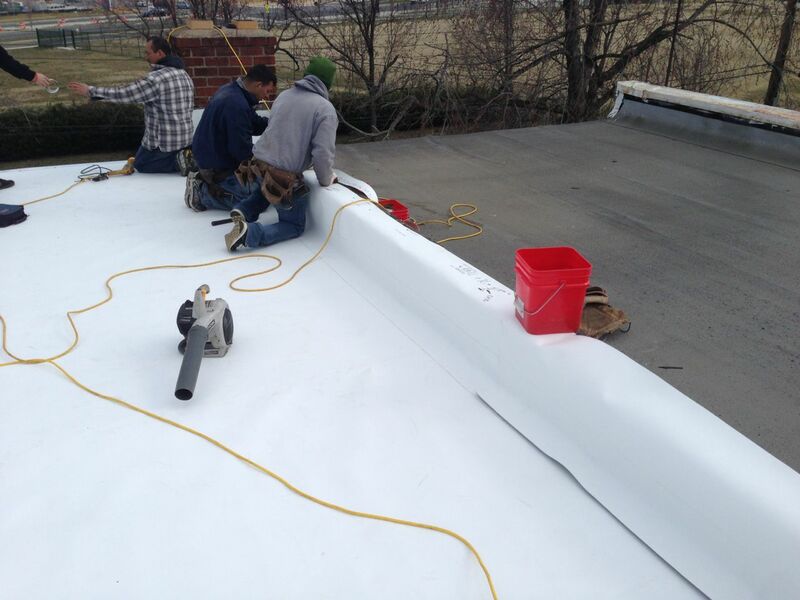 After the insulation is finished and secured we install new White Firestone TPO roofing over the entire roof; the membrane is then fastened at the seams and adjoining walls with screws and seam plates. 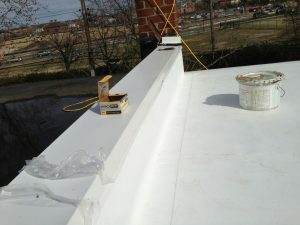 Fastening the membrane at the walls and any angle change is critical to the long term performance of the roof and something that much of my competition doesn’t do; it takes time but it will assure that that roof lives out its design life. We install another TPO flashing membrane over our fasteners at the edges of the roof and have the flashing lap over the top of the parapet wall. 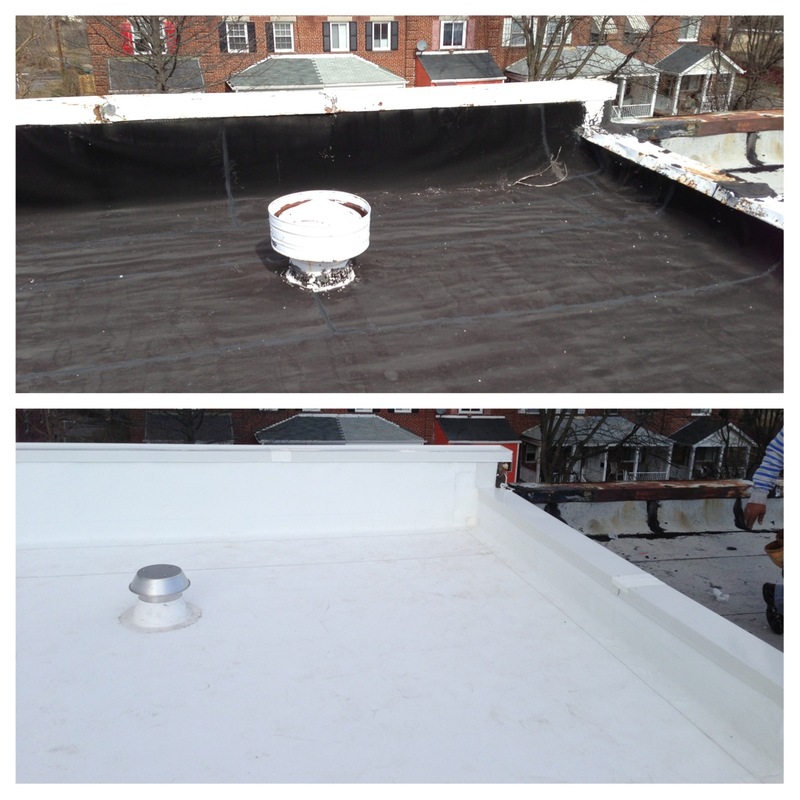 After the new TPO roofing is done we install new wall coping (White metal cap) on top of the adjoining parapet walls. We fabricated this in the shop a few days before we come out to do the job. The coping is made from 032 aluminum and has a plastic protection film that we peel off when the job is done. New white wall coping over the adjoining walls. We replaced the original air vent with a new aluminum vent; the new vent has a bird and insect screen to keep out unwanted guests. Compare my new roof with the neighbors- you can see that the water will be rolling right off the new roof while the other looks like a rice paddy. If you’re having problems with your row house roof just call (703) 457-6560 and ask for Tom; or fill out the form to the right and I’ll be right with you.